New Delhi: The telecom operators' association on Thursday said Reliance Jio's offer was a "compelling proposition" and good for consumers, but its tariffs cannot be termed as "killer" that will do away with competition. 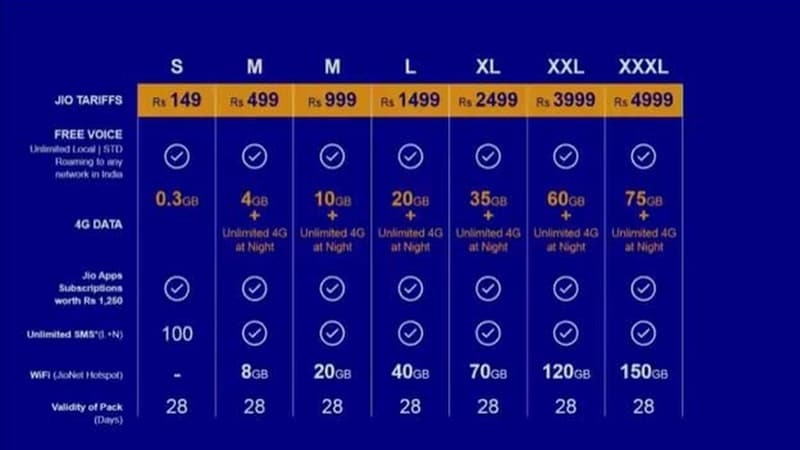 The Cellular Operators Association of India (COAI), which is leading the front in a fight with Reliance Jio over inter-connect issues, said competing operators are already matching the price points in most plans the new entrant announced on Thursday. Consumers will not pay low prices for low quality, he pointed out. "Initial advantage will be for Reliance Industries, given the empty network... but over time, we will have to see if that can be sustained," he said. At the 42nd annual general meeting of Reliance Industries, Chairman Mukesh Ambani said all voice calls will be free for lifetime for Reliance Jio customers while data plans will start at Rs. 50 per GB a month. Incidentally, Reliance Jio is also part of the cellular association. On aggressive pricing by Reliance Jio, Mathews said, "It is good for the customer vis a vis affordability. It ties in to the government's policy on connectivity and affordability." "But other than Rs. 19/day tariff, most of the other price points in the mid to high range plans are already being matched by the incumbents in some form or fashion," he explained. These are not killer tariffs that will do away with competition, he added. Mathews said that against the average revenue per user of Rs. 180/month prevailing in the industry, Reliance Jio appears to be positioning itself for Rs. 400-499. "It will grow the market... incumbent operators will be able to get additional revenue," he said. Mathews said the claim of free calls is not entirely correct as the tariffs bundle data and voice. Reliance Jio has been engaged in a stand-off with the existing cellular operators on the points of inter-connect or ports required for connecting calls and SMS between two operators. It has accused incumbent players of not releasing sufficient inter-connection ports during its test run of services while the existing operators (under the aegis of COAI) have dubbed its testing of network as an effort to bypass sectoral regulations. On allegations that incumbent operators had not provided enough points of inter-connect during the test phase, Mathews said the operators had met their obligations on their understanding of the network load and provided capacities for up to 20 million users. "If these services are commercial now, then Reliance Industries can make requests as per the rules, and incumbent operators will respond accordingly," he said. A third arbitration over Oil Ministry decision to take away five of RIL's KG-D6 block discoveries fell after the company failed to name arbitrators within the stipulated time. RIL and Niko did not name the arbitrator for the dispute settlement. Interestingly, BP which holds 30 per cent interest in KG-D6 block, had not signed on the arbitration notice. Gas output from Dhirubhai-1 and 3 gas field in the Krishna Godavari basin KG-D6 block was supposed to be 80 million standard cubic meters per day but actual production was only 35.33 mmscmd in 2011-12, 20.88 mmscmd in 2012-13 and 9.77 mmscmd in 2013-14. The output has been around 8 mmscmd in subsequent years.